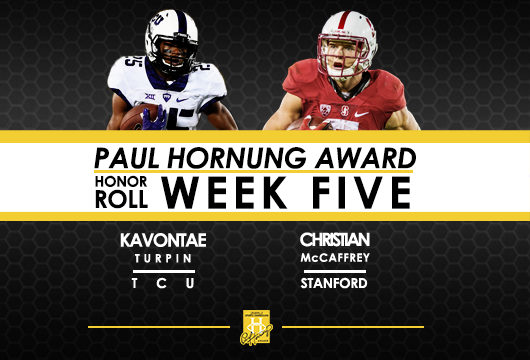 Louisville, KY – Monday, October 5, 2015 – Christian McCaffrey (Stanford) and KaVontae Turpin (TCU) helped their teams to wins over conference foes and a spot atop their respective conference standings as they earned the Paul Hornung Award Honor Roll in week five of the season. 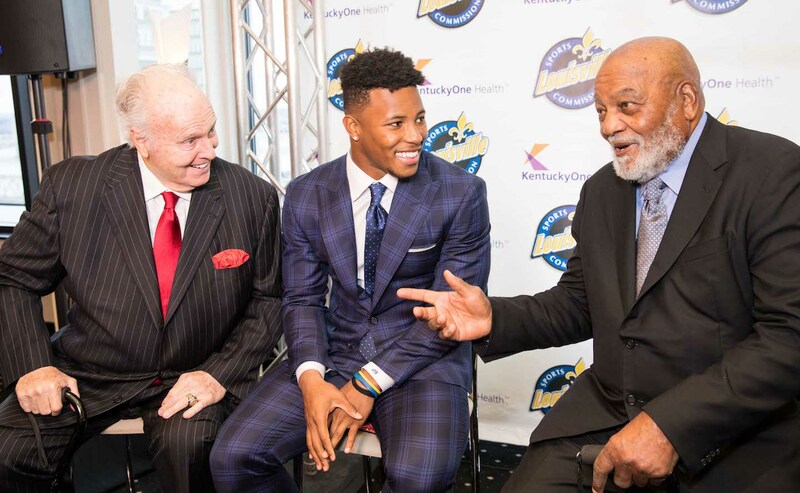 The two combined for 442 all-purpose yards, five touchdowns and each touched the ball four different ways, exemplifying their versatility on the field. The Paul Hornung Award, presented by Texas Roadhouse, is awarded annually to the most versatile player in major college football. The winner and his family will be honored on February 25, 2016, at a banquet presented by KentuckyOne Health at the Galt House Hotel in downtown Louisville, Ky..
Stanford sophomore running back Christian McCaffrey made the Honor Roll for the third consecutive week by gaining 260 all-purpose yards and leading the Cardinal to its fourth straight win, 55-17 over Arizona. He ran for 156 yards and one touchdown, caught two passes for 11 yards, ran back a pair of kickoffs for 98 yards and returned four punts. McCaffrey, who lines up at tailback, slot and Wildcat QB, leads the nation in all-purpose yards per game with 229.8. Stanford is now 4-1 on the season and leading the Pac-12 North division at 3-0. TCU freshman wide receiver KaVontae Turpin caught four touchdown passes – the most by a freshman in Big 12 history – and touched the ball four different ways in the Horned Frogs’ 50-7 win against Texas. His four touchdown receptions are tied for the most in a game by an FBS player this season and the most by a freshman. Turpin finished the day with six catches for 138 yards, both career bests, and had at least one receiving score in three of the last four games. Turpin added two carries for 14 yards, a four-yard punt return and a 26-yard kickoff return to finish with 182 all-purpose yards on the day. TCU is now 5-0 this season and 2-0 in the Big 12.